Akit's Complaint Department: Clipper Card Glitch Screws Passengers Again - When Will it Stop? Clipper Card Glitch Screws Passengers Again - When Will it Stop? Broken readers is just one of many problems. 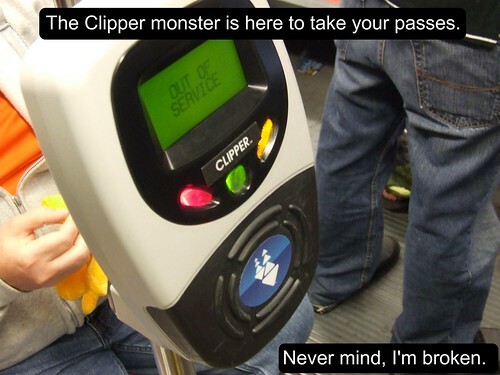 If you have a Clipper card, you may have been a victim of glitches or problems that are not your fault. 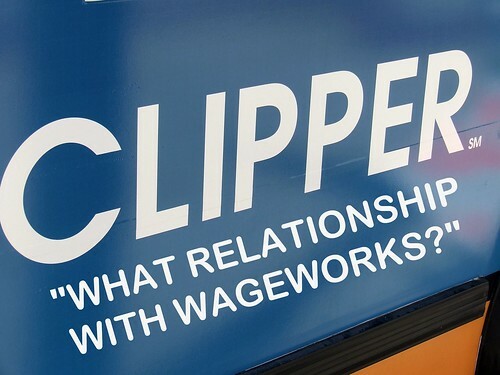 Throughout the years that I've been blogging about Clipper, I've written my fair share of issues and try to get MTC, and Cubic Transportation Systems (the contractor running the Clipper card) to get it fixed. Starting on June 1st, Muni decided to end the paper version of the free ride transfers for those who exit Daly City BART and switches to the Clipper card handling the transactions. This matter was concerning to commuters who used the SF State free shuttle as the transfer policy requires the passenger to ride the 28/28L line bus away from the station within the first hour of exiting the station; by taking the SF State shuttle, the transfer on the Clipper card is void and a return trip from SF State to BART will be charged at regular price. Muni and SF State worked out a plan, effective August 1, 2012, instead of the one hour policy, it was extended to 23 hours for the first Muni ride. The reason behind this is students that take the campus shuttle away from the campus, and can still ride the 28/28L line going back to BART with no fear of being charged a $2 fare (as long as it's within 23 hours of exiting BART). Read story about the change in transfer policy. But things didn't work out as planned. As reported by the Golden Gate Xpress, the supposed reprogrammed transfer policy had a glitch and students who took the campus shuttle away from Daly City, was charged a $2 fare for their return to BART when taking a Muni bus. Muni admitted the error and promised to have a fix by October 26th and Clipper will refund any passenger affected by the glitch. The problem I have with this is, why do these glitches keep cropping up, and why isn't the contractor (Cubic Transportation Systems) not making sure it works perfectly the first time, every time? In August 2012, there was a discovery that happened in 2010 when their cards enrolled with autoload funded their cards, but didn't charge their credit card at the time of the reloading of funds. Passengers were finally charged in August 2012 on their credit cards for the reloaded funds. Back in May 2012, AC Transit passengers complained that when they rode an AC bus, transferred to BART, and took another AC bus, they were overcharged on their fare. This glitch was the same problem Muni passengers faced before (see below). At the same time, passengers who rode Muni, took BART, and transferred to Muni was also overcharged. I originally reported on the problem back in June 2011 and while Clipper promised to get it fixed, people were still getting screwed until May 2012. A software glitch delays the implementation of Clipper on Samtrans. MTC fails to notify public until I broke the news. In October 2010, I reported on the Clipper card readers beeping like crazy and it wasn't fixed until February 2011. On one day in July 2010, a software update to Clipper card readers on Muni failed to work properly resulting in disabled Clipper card readers. April 2010, software update disables TransLink (pre-Clipper era) card readers. I think I've made my point clear. MTC needs to force Cubic to wise up and make sure that whenever there's a software or firmware update, that everything is throughly tested BEFORE the public uses it. For every mistake or problem, people lose money from their Clipper card from errors or overcharges, transit agencies don't generate the correct revenue, and the time wasted for fixing the errors and issuing refunds to those affected.